In this episode, Hackie Reitman, M.D. 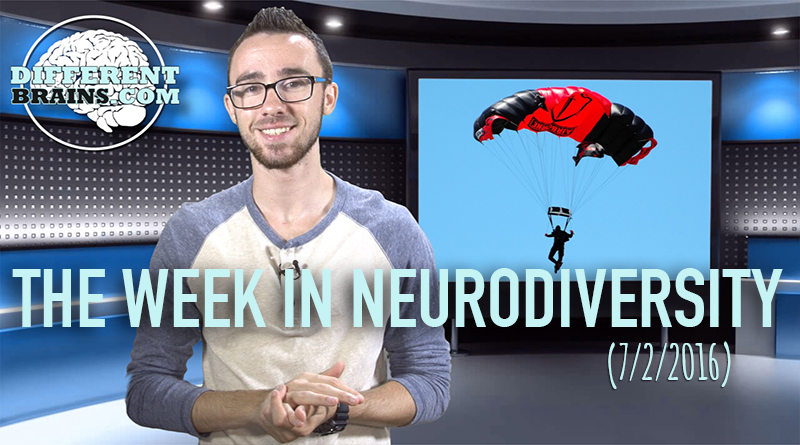 interviews Harry Lowe, a student with Asperger’s Syndrome studying political science at Metropolitan State University of Denver. 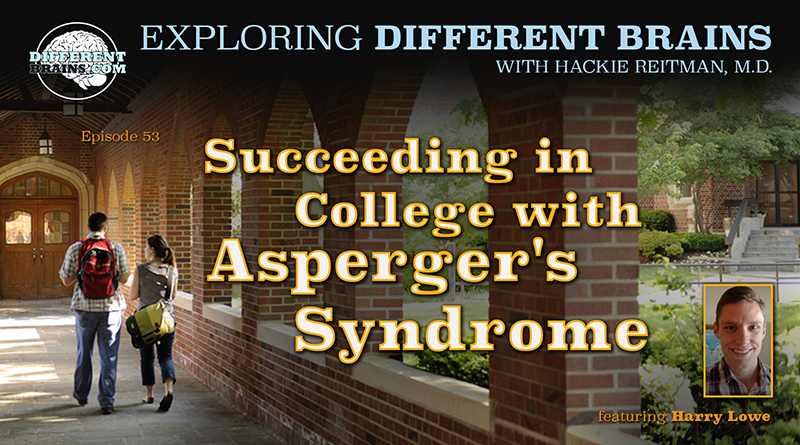 Harry discusses growing up with Asperger’s, his experience in school, and the importance of support systems for the neurodiverse. Harry is also one of our newest writers here at Different Brains. To see what he has written for the site, click here. HACKIE REITMAN, M.D. (HR): Hi I’m doctor Hackie Reitman, welcome to another episode of exploring different brains. Today we have Harry Lowe, a student at Metropolitan State University in Denver, Harry how are ya? HARRY LOWE (HL): Great, how are you? HR: I’m good, good to have you on here. What are you majoring in Harry? HL: Political Science and then I’m minoring in legal studies. HR: What do you want to be when you grow up? HL: I have my eyes on a paralegal position right now. HR: Oh nice, well I’m still trying to figure out what I want to be when I grow up, so I’ll get there. Tell us the story of how you got your diagnosis of Asperger’s and in so doing tell us about your journey about feeling comfortable because we really appreciate you talking to us about this ok. Tell us about your diagnosis and everything. HL: So I went to private school in Denver from 3rd to 1intervieweeth grade called Denver academy, which focused on kids with learning differences. After I graduated from DA I went to a school college Colorado College which is a small liberal arts school in Colorado Springs. And I didn’t do well in my first semester there. I was always a pretty good student in high school so my dad and I were pretty concerned about that. So we looked online for clues that might have been happening. HR: At that point, before you got your Asperger’s diagnosis did you have any labels or anything? For instance my daughter Rebecca, who had 23 brain tumors and a seizure disorder and two different brain surgeries, when she was going to Georgia Tech they labeled her as having ADHD having memory deficits that kind of thing but it wasn’t until after she graduate that I accidently learned that she had Asperger’s. So, when you went to this private school first, what kind of learning disabilities did they think you had? HL: So I was originally diagnosed with non-verbal learning disorder. So it was a sort of a social skills deficit that I was diagnosed with. That was my diagnosis all through out high school and the first semester of college. And then after my first semester of college, my dad and I were sort of looking around for what might have gone wrong and we stumbled across a diagnosis of Asperger’s. It sounded like a lot of what I had been diagnosed with in the past and a lot of new things that fit me. HR: Who gave you the diagnosis Harry? Like was it a psychologist or a behaviorist or what kind of professional? HL: I think it was a psychologist; it was someone in Houston that specialized in this. So I got my diagnosis down in Houston and then once I was diagnosed, the Houston people helped me out a little bit and then I went to. Bloomington, Indiana for a while to a program called the college internship program. HR: What are the big differences you feel aside from your own personal growth and development between the school you were going to then and the school you’re going to now. HL: Right, so Indiana University Bloomington is very much typical college town sort of experience. You got the beautiful campus, lots of dorms, small downtown district with shops and bars and restaurants. You know the whole town sort of revolves around the college. And the school I’m going to now is sort of a commuter school in downtown Denver. I actually like it better because there are fewer school related distractions, so in a college town like Bloomington there are always say parties to go to or things to do. At metro state it’s very focused on, everyone is going there. HR: You go there you do your work and you go home. How are you finding it academically now Harry? HL: I’m doing well. I’m going part time now and working part time. HR: Now what does it take to be a paralegal now a days? HL: So it’s basically, what a nurse is to a doctor a paralegal is to a lawyer. HL: So they sort of draft documents, do a lot of the same stuff that lawyers can do but not the most technical aspects. HR: While you’re going to Metropolitan State University are you living at home or on your own? HL: I’m living on my own right now. HR: Do you like that? HL: I do like it. I’ve lived with roommates for a long time and I think I prefer living alone just because it gives me more freedom. I like it a lot. I live in a great area in Denver so I can’t complain. HR: Where about in Denver is that? HL: It’s called capital hill, it’s near downtown. Denver is the capital of Colorado so it’s sort of near the capital. HR: How do you feel about self-identification? Like with my daughter Rebecca she’s going for her masters in applied psychology, she doesn’t like to identify herself per say as having Asperger’s she does ask for the accommodations and everything but doesn’t really like to go out of her way to let her classmates know. How do you feel about that? HL: I take a similar attack. Unless someone really wants to know and I feel like I can trust them with that information I don’t really tell people. Because it gives people a certain impression that is false. HR: What advice could you give because you’ve been through a journey? We might have someone watching this who might be in high school, going to be going off to college. What advice can you give them? HL: My main advice would be in college there are many people in college wanted to succeed and can help you succeed as long as you take advantage of the resources that are there. Such as something as simple as a family and friend support structure. If you’re having a tough time, you can call them text them talk it out. Accommodations, college itself wants to help you succeed and there are things you get like a note taker or time and a half on tests. Sometimes recordings of the lectures. It’s easy to get these things with out your classmates knowing that you are getting them if that is something you’re concerned about. Because I know a lot of people don’t pursue the accommodations because of perceived stigma. So it’s easy to get them discretely. That would be my main advice, just use your support structures because very few people can do it on their own. HR: Do you have any aspirations to go into politics? HL: I’d love to, I don’t want to run for office but I would love to work in that area if the chance ever arose. HR: Yeah you strike me as somebody who might want to be behind the scenes working on campaign. HL: Yeah I think that’d be very interesting. I love my city, I love my state, and if I could play a role in trying to make it better then I would jump at the chance. HR: When do you graduate? When are you scheduled to graduate? HL: I’m scheduled to graduate next year, probably December. HR: From your point of view, do you want to go onto any graduate education or get right into the work force? HL: Right away at least I think I’d like to get into the work force. I’ve been in school for awhile and I’d like to sort of get going on things I’m passionate about instead of fulfilling requirements and taking classes I have to take. I’d like to do something that I’d like to do for a while. HR: Gotcha, nice. What do you think is the biggest mistake that parents like me make? HL: I would say stick with your kids and check in on them every once in awhile make sure they’re doing ok. A lot of them will just say I’m fine; everything is fine, when maybe some things aren’t fine. Maybe try to dig a little deeper with out antagonizing. Try to figure out what’s going on and see what you can help them with because everyone is always got something they’re struggling with. Parents are I think a vital resource to helping get through that. HR: Did you have any experienced growing up with bullying? HL: You know I did, it wasn’t anything horrible. Like I said I went to a school with kids with learning disabilities so everyone there was at least sort of like me. There were a lot of kids with ADD or ADHD or dyslexia diagnosis. So that wasn’t really a subject of bullying, learning disabilities. Middle school or elementary school kids or high school kids are going to act. HR: how high school, middle school, and elementary school kids do. HL: right. This is going to sound a little negative but it’s not meant to. No matter where you are in life you’re going to encounter some people like that and it’s just all about how you react. You just got to sort of shrug them off and go about your business and not worry about it. HR: That’s good advice. Harry I have a chapter in the Aspertools book about the importance of having a safe place to get to. Would you say the colleges you’ve attended are safe place friendly if you know what I mean? HL: Can you expand on that a little bit? HR: Yeah it’s like you know we all get some anxiety if we don’t know that there is a place where we can get to that is quite, to many of us it’s our rooms, to some it’s the library, some people it’s putting headphones on with music, and I was just trying to see from your point of view if schools you’ve been to have a safe place to get to kind of thing? HL: Yeah I would say the do. Indiana University there was a big central library you could go to. I lived in the dorms for a while so you could go back to the dorm. I also lived off campus for a while so you could go back to your apartment and find a quiet space there. Even at Metro State it’s sort of right in the middle of downtown Denver and it’s sort of a hustle and bustle atmosphere but there is a library, which on the second floor there is a bunch of stacks of books and off to the side chairs where you can study which is a nice quiet place. There is a building called the student success building with study rooms you can go to and relax. There is a brand new quad where you can just sort of sit down and think. So yeah pretty much no matter where you are even if it’s maybe a place like, not that I’ve ever been there, but a place like NYU or something right in the middle of New York City where you would think that there is no quiet place, you can find a quiet place if you just look a little bit I’m sure because college especially know that students need quiet places to study and think and sort of decompress after sort of stressful periods during school. HR: Tell me from your point of view, give me a profile of your dad. HL: Sure, so he is a lawyer in downtown Denver, he worked for a bunch of different big firms after law school and then about 15 years ago he started his own firm called Lowfeld and Scog which he still runs with a couple other people. He’s just been, especially early on he was my cheat advocate and is still very supportive with my journey through college with Asperger’s. He, my step mom, my siblings, my mom, they’ve all been just great. HR: When you were growing up did you have any interest in politics then? Like when did you get interested in politics? HL: I wasn’t really interested in it until college. I can’t really point to anything in particular that sparked an interest, I think just one day I started reading some articles on the New York Time and I just enjoyed it. So I sort of stuff with it. HR: You must be in heaven with this presidential election. Heaven or hell ha-ha. HL: Even I am ready for this to be over. I think our campaigns are just so incredibly long, you could cut 9 months off and it’d be just fine I think. HR: Well I’d like to see you go into politics even behind the scenes because we could use good people like you, you’re a straight shooter. HL: I appreciate that, thank you. HR: We need more of that. Well Harry Lowe, it’s been a pleasure, thank you so much for being on this episode of Exploring Different Brains and I hope we stay in touch. HL: Of course, my pleasure, thanks for having me. HR: Well we’ve been speaking today with Harry Lowe, a student at Metropolitan State University in Denver and Harry it’s been a pleasure having you today. HL: It’s been a pleasure being here, thanks for having me on. (22 mins) In this episode, Hackie Reitman, MD. speaks with David A. 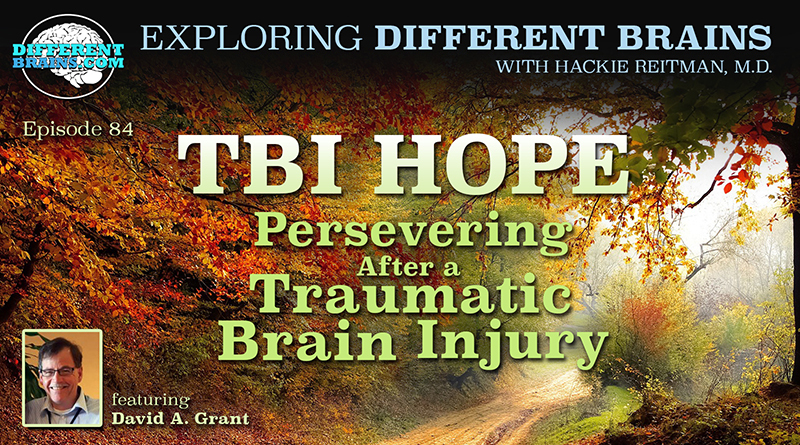 Grant, the founder and publisher of TBI HOPE Magazine. David is a brain injury survivor that has dedicated his life to being an advocate for those affected similarly. 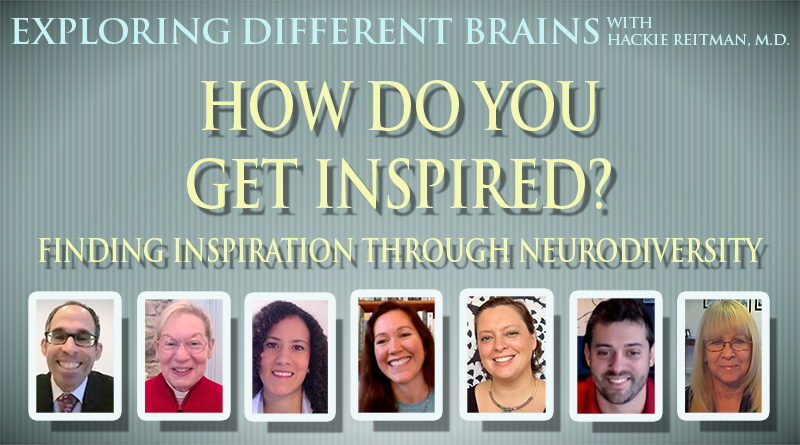 In this episode, Dr. Hackie Reitman speaks with 7 amazing people from the world of neurodiversity- parents, employers, educators, and authors – as they tell us how they found their inspirations to make change in the lives of those of us with Different Brains.